Memaksimalkanm 30 menit pertama dengan Windows 8 (copas) | LKP. Vikaniova.Net Sonder "sharing is great!" You’ve successfully installed Windows 8. You’re staring at the Start screen, in all its flat-tiled glory, and it all seems completely alien based on your previous experience with Windows. As with any new version of an operating system, your first half-hour is critical. You’ll want to learn the basics of navigation, how some important built-in applications work, and how to set up basic functions, including networking, backup, and user accounts. For this article, I’m going to assume that you now have Windows 8 running, and that you can see the Start screen and associated tiles. I’ll also assume that all the current drivers, including networking drivers, are properly installed. First, let’s go over some basic navigation tips. It’s likely most early Windows 8 adopters will be using displays that lack Windows 8’s ten-point multi-touch capability, though a few may spring for some of the shiny new systemsthat bring the touch interface to mainstream laptops and all-in-one PCs. So, we’ll focus on basic keyboard and mouse navigation. Now, you did watch the one tip that Microsoft built into the setup process, right? What’s that you’re saying—you just clicked through the initial startup screens without reading them? Okay, most of us don’t always read the text during the tedious setup. It’s also likely that you skipped logging in to, or creating, a Microsoft account, opting instead for just a local account. 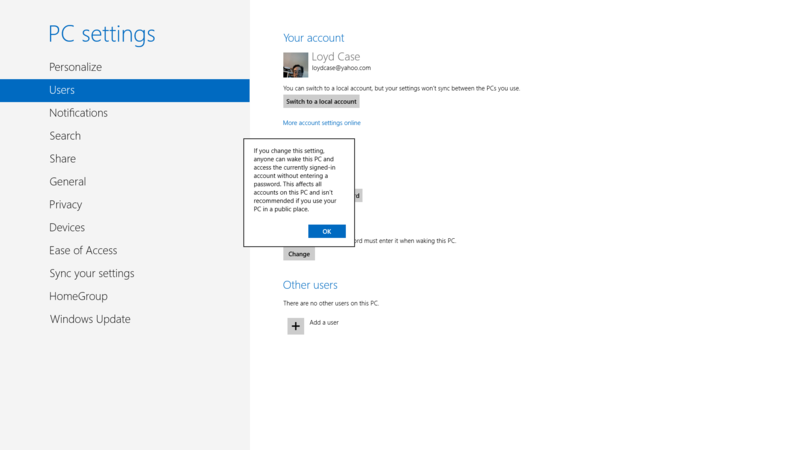 That’s okay too—though in a bit I’ll touch on why a Microsoft account might be useful. But first, back to basic navigation. The key tip Microsoft showed you, in case you missed it, is simple: Move your mouse to the corners of the screen. As with all things Microsoft, though, it’s not as simple as you might think. In different contexts, moving your mouse to a corner means different things. When you’re in the Start screen, moving your mouse cursor to the upper right or lower right brings up the Charms bar. 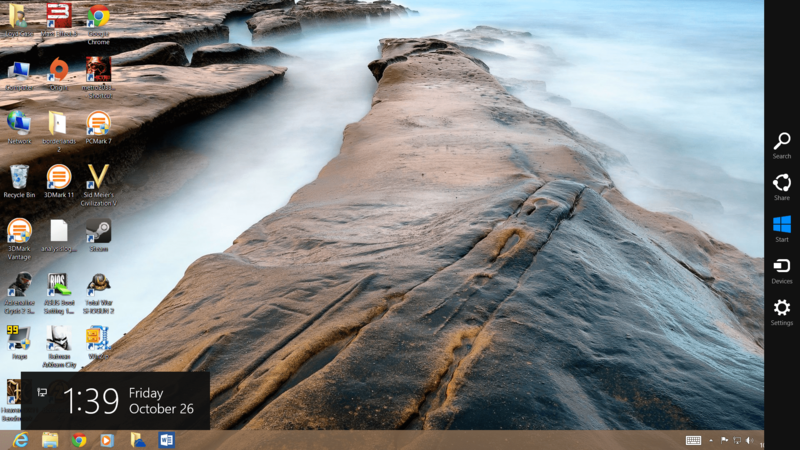 The Charms bar is simply a set of five icons on the right side that represent key system functions, and the bar is available wherever you are in Windows—even when you’re in the traditional desktop. At first, you’ll primarily care about two of the icons you see: the center, windowlike one, which returns you to the Start screen; and the Settings icon, which is the bottom one. The Settings icon is key, because that’s where the shutdown/restart button now lives. Now, move your mouse to the lower left corner, and you get…nothing. Nothing, that is, until you run something else—your first Windows 8 app. Indeed, if you have active apps running, moving your cursor to the lower left will show you a small thumbnail view of the most recent app running (including the Windows desktop.) However, mousing to the lower left is nothow you primarily return to the desktop. It’s just how you get back to your most recently used app. Now, move your mouse cursor to the upper left corner, let it hover there for a moment, and then move the cursor down slightly, and the app-switching bar will pop up on the left side of the screen. This bar displays a thumbnail list of all currently running apps. You can then drag an app thumbnail to the right to make it take over your screen. If it’s a Windows 8 app (and not a desktop program), you can run it in split-screen mode by dragging it down, and letting it dock to the left or right side. Now here’s an important trick for longtime Windows users: If you right-click in the lower left corner, you’ll see the Simple Start menu. Simple Start is lets you quickly launch common system-management functions, like the control panel, disk management, the run dialog box, and so on. Simple Start pops up whether you’re in desktop mode or in the Start screen. I’ll touch briefly (pun intended) on using the touch interface, in case you’re lucky enough to have a multitouch-enabled device. Again, I’m just going to cover the basics. If you swipe in from the left, then abruptly change direction and swipe off the left side, you’ll see the app-switching bar listing all currently running Windows 8 apps. You can select any of them by touching the peek icon. Note that desktop apps are simply shown as a single representation of the Windows desktop, even if you have multiple desktop apps running. All of this mousing around may seem tiring, so you may want to consider using basic keyboard shortcuts for easier navigation. I won’t list all the shortcuts, but here are some popular ones that ease navigation chores. Most involve pressing the Windows key plus some other key. Windows-C: Shows the Charms bar. Windows-R: Goes to the desktop and shows the Run dialog box. Windows-E: Opens the computer, which enables you to use the file manager. Windows-I: Pops up settings, where you can easily get to the Windows settings screen or shut down the PC. Windows-X: Brings up the Simple Start menu, allowing easy access to key system-management apps, like the control panel. Check out our comprehensive list of hotkeys, in case you’re looking for more. When you initially set up Windows 8, network drivers were installed and started. (If not, you’ll need to install a network driver.) But that’s just the first step. Assuming you have other PCs, you’ll need to connect your Windows 8 PC to your existing network. Assuming you have a workgroup created, you’ll set up Windows 8 networking just like you did with Windows 7. The quickest way is to press Windows-D to get to the desktop, then press Windows-C. The Charms bar in the desktop is slightly different than in the Start screen in one important way: Clicking on Settings will present you with a pop-out that looks like the one you see in the Start menu but happens to list the Control Panel, Personalization and other desktop-centric settings. At this point, you can run the Control Panel, and then manage network settings there. 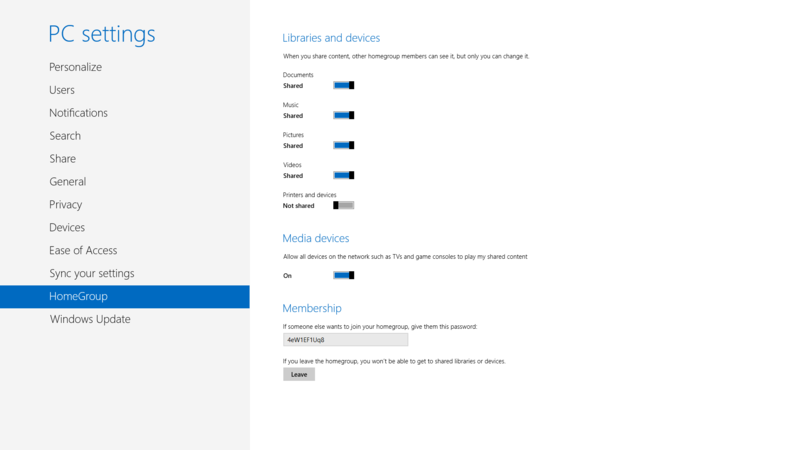 Windows 8 supports HomeGroups, so you can also connect your PC to the Windows Homegroup, provided you know the password. Homegroup settings, including entering or changing the HomeGroup password, reside in PC Settings. Press Windows-C and selectSettings, and then select Change PC Settings and navigate to the HomeGroup menu entry. 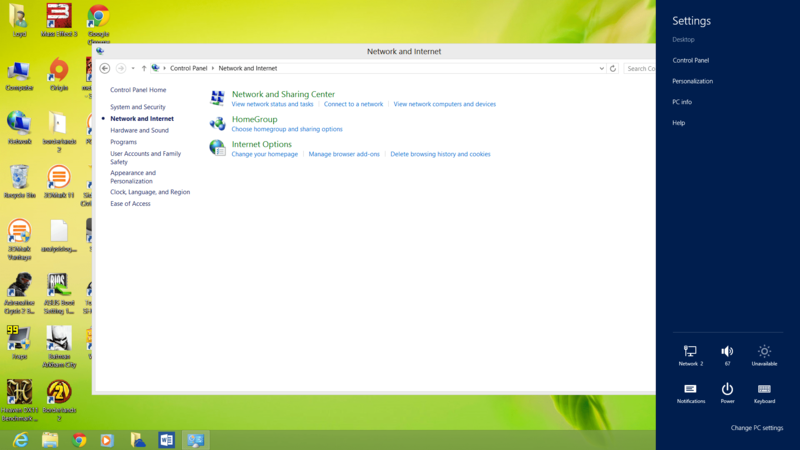 Windows 8 supports Homegroups, so you can easily add your new Windows 8 system to your existing network. Note that you may have been asked to connect to the HomeGroup during the Windows setup. If you’ve taken care of that chore already, then you’re good to go. But this screen is also handy for changing sharing settings. User management in Windows 8 works similarly to the way it did in Windows 7. However, you now have two ways to manage users. The old way, through the user Control Panel, still exists. Remember, getting to the Control Panel is easy: Press Windows-X to bring up the Simple Start menu and click on the Control Panel menu entry. There’s one new entry in the legacy Control Panel user-account-management screen, however. The User control panel is still available. The top clickable item under “Make changes to your account” is “Make changes to my account in PC settings.” Clicking this item takes you to the Windows 8 version of user management. 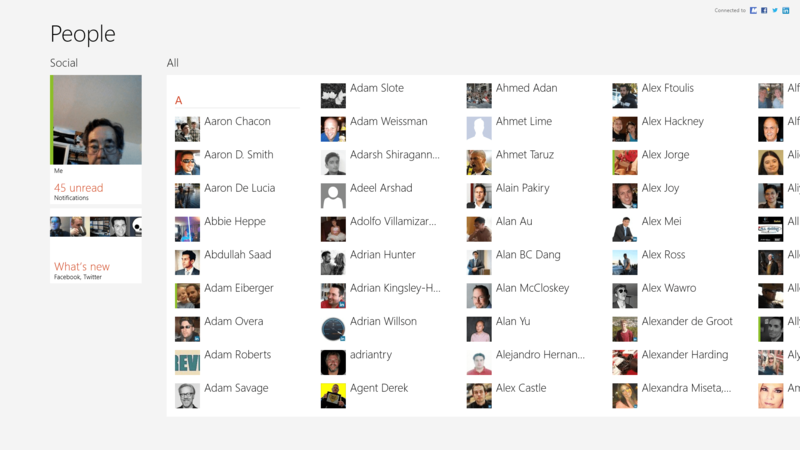 You can also access the Windows 8-centric user-management screen directly. Bring up the Charms bar, select Change PC Settings, and click on the Usersmenu entry. The Windows 8 User control panel offers more control than the one in Windows 7. Note that the system illustrated in this example is currently set up as a local account. One of the options in this screen (that’s not present in the legacy User control panel) is “Switch to a Microsoft account.” If you’re a home PC user, you may not want to choose this, since you’ll always be prompted for your Microsoft account login when you first start up your PC. But there are benefits to having a Microsoft account. 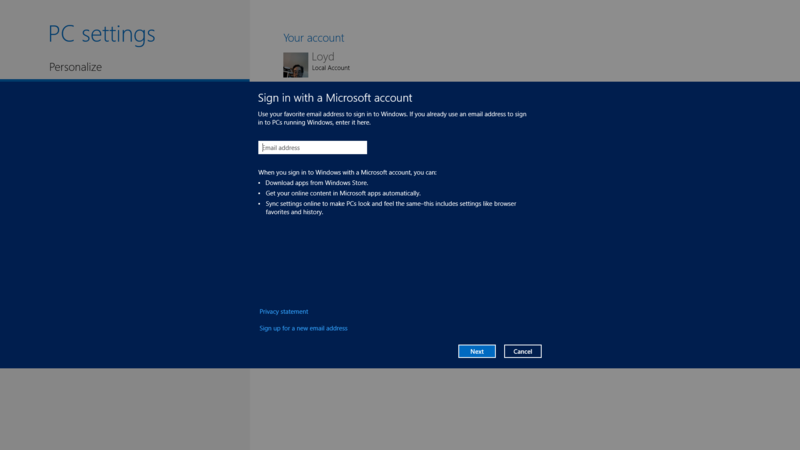 If you add Microsoft account sign-on after installing Windows 8, you’ll be asked to supply your Microsoft login information. 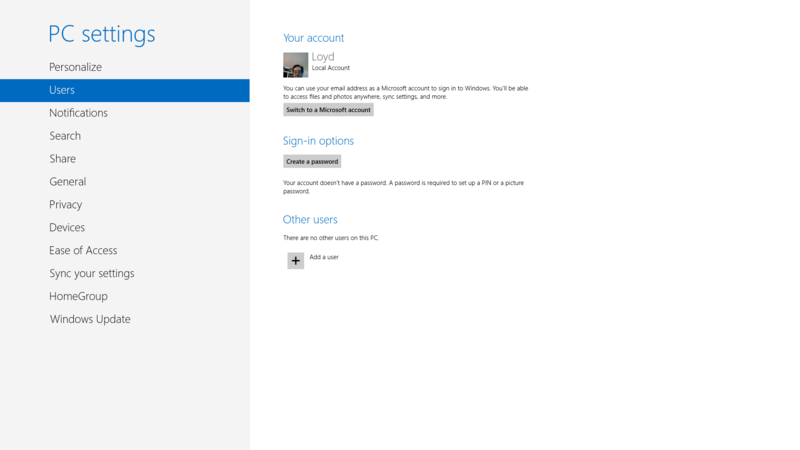 Logging in with a Microsoft account gives you single sign-in privileges. Note that if you don’t have a Microsoft account, you can click on the Sign up for a new email address link at the bottom, which will launch a browser where you can create both an account and a Hotmail address. However, you don’t need to use the Hotmail address as your account ID. 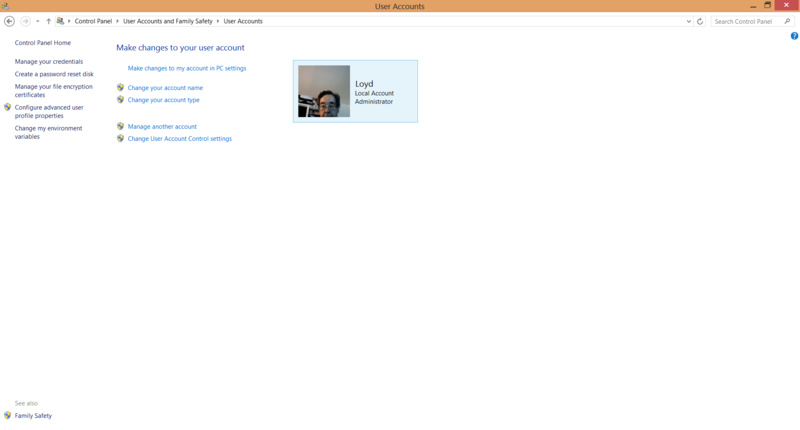 I use my personal (non-Hotmail) email account as my Microsoft account login. You’ll also be asked to verify whether the PC you’re connecting to your account is trusted. You’ll get either an email or an SMS text message (depending on how you configure your Microsoft account) asking you to verify this system. You only need to do this step once. Note: You do not need to be connected to the Internet to log in to your PC when you turn it on—assuming you use the Microsoft account login feature. You can even disable the requirement to enter a password (you do so in the PC Settings Users screen), but you’ll get a warning if you do this. If you use a Microsoft login, enable password login on startup unless you’re really sure no one else will use your system. Only enable this if you’re confident no one else will be using your system. If other people do, they’ll have full access to your Microsoft Store account, your SkyDrive, and other shared features. Being connected to the Internet and logging in with a Microsoft account gives you several benefits. First, as mentioned earlier, you have access to your SkyDrive cloud storage. If you have other PCs, smartphones, or tablets, you can access SkyDrive from any of your Internet-connected devices. This feature saved my bacon during the course of my work at PCWorld, allowing me to send my editor a critical file using SkyDrive on my iPhone. Every Windows 8 user gets 7GB of free SkyDrive storage. If you exceed that amount, you have to pay an additional, ongoing fee. However, 7GB is fairly substantial, provided you’re not storing tons of high-resolution images and video. You also have what’s known as “single sign on.” You no longer need to enter your account info when you go to the Microsoft Store, the Music store, or other features. You’ll be able to sync your main PC’s settings with other Windows 8 PCs you may use, provided you can log in to those PCs with your Microsoft account. So it’s easy to keep your Windows 8 laptop and Windows 8 desktop in sync. As useful as a Microsoft account can be, there are pitfalls to using one, too. SkyDrive itself has some odd limitations compared with similar services such as Dropbox. SkyDrive imposes a 2GB file size limit, which makes uploading large, high-definition video files problematic. Also, Microsoft has reserved the right to monitor what you upload, and if it thinks what you’ve uploaded is illegal, you’ll find those files deleted. If that Big Brother aspect of SkyDrive troubles you, you may want to consider other services instead. A Windows 8-style SkyDrive app is included with your Windows 8 installation, but how do you get to your SkyDrive folder from desktop software, like Microsoft Office? If you use the Office 2013 preview, you’re asked for your Microsoft login, so you’ll automagically have SkyDrive access. But other apps might not be so smart. In addition, you may simply want to copy files between local folders and SkyDrive. While you can do this with a Web browser, that’s a cumbersome process at best. 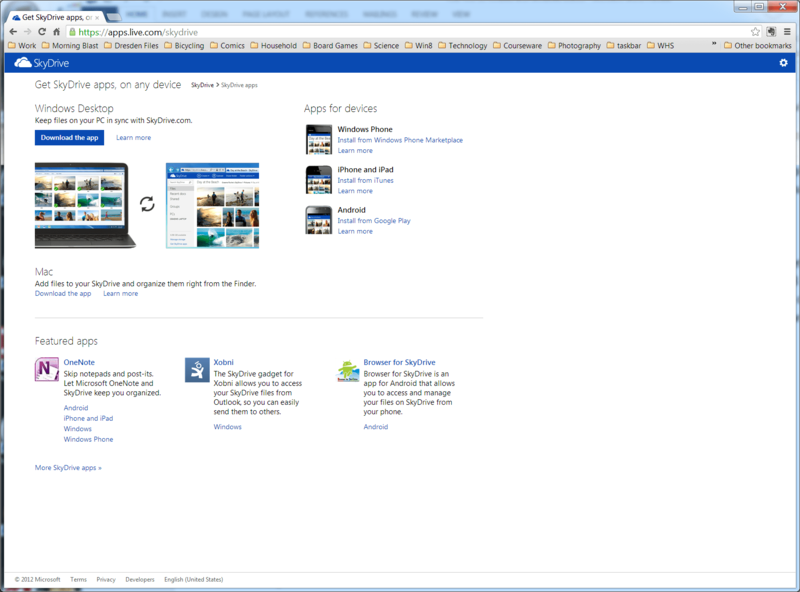 The answer is to download and install the SkyDrive app. The SkyDrive desktop application adds a SkyDrive folder to your system and conveniently adds it to the Favorites list in the Windows file manager. If you use SkyDrive, you should get the desktop app. Microsoft supplies SkyDrive apps for Windows (Vista, Windows 7, and Windows 8—but not Windows XP), Windows Phone, iOS, Android, and MacOS. So if you’re using SkyDrive, you’ll want to get the necessary apps. Before we look at the preinstalled apps, it’s discussing for a moment what an app actually is. Windows 8 now has the concept of two types of apps. One type is called Windows 8 apps. These are the apps you buy or download for free from the Microsoft Store—and only from the Microsoft Store. Most will have some cross-platform capability, so they’ll also be available on Windows Phone 8 and Windows RT, Microsoft’s tablet-only OS that runs on ARM processors. The other type of app is what we normally think of when we think of software running on Windows—what Microsoft calls “desktop apps,” though individual Microsoft folk have occasionally slipped up and called them “legacy apps.” Desktop apps will be sold and serviced as they always have. You can get to them from the Microsoft Store, but you’ll typically be taken to the publisher’s website. You can buy them from retail outlets and install them that way. Other ways to buy them include various digital-downloads purveyers—from Amazon.com to Steam to direct from the developer. So while the new Windows 8-style apps are curated and approved by Microsoft, similar to the way Apple handles iOS apps for the iPad and iPhone, traditional desktop software will still be available the way it has always been, and Microsoft doesn’t approve or otherwise edit desktop applications. 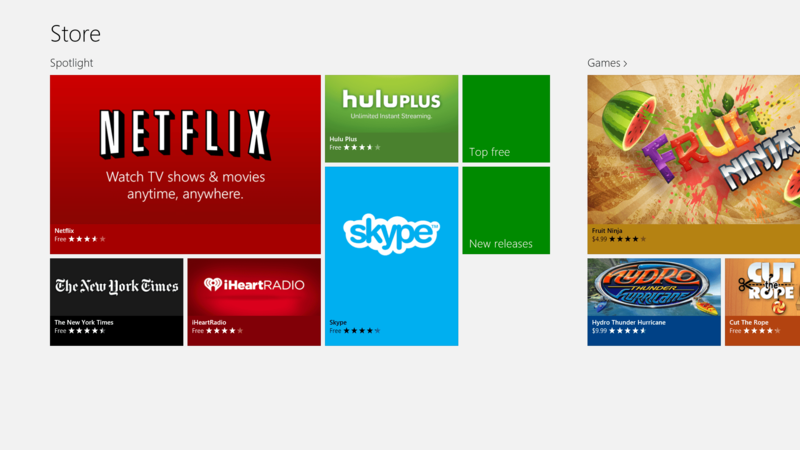 Now let’s take a quick look at preinstalled Windows 8 apps. 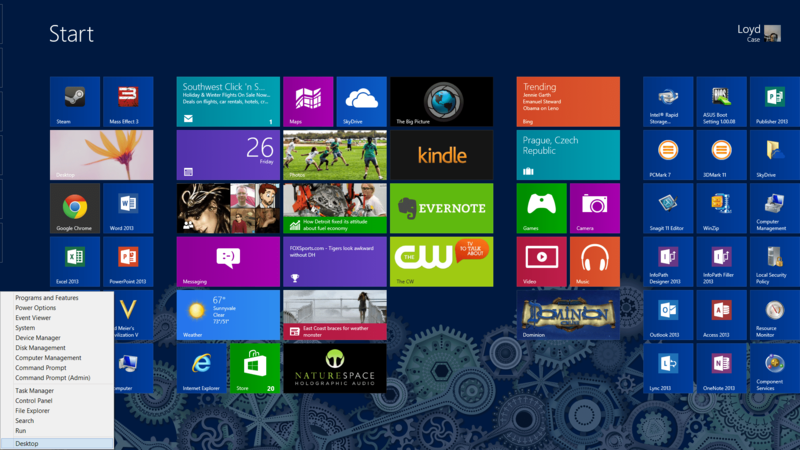 Your Windows 8 desktop PC should be set up and ready to use, if not fully tweaked to your personal preferences yet. 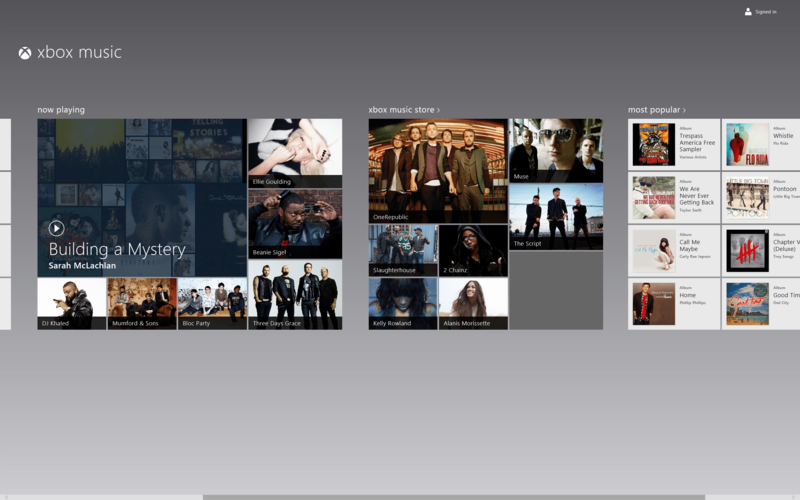 Now let’s take a quick tour of some of the preinstalled Windows 8 apps. This is not a comprehensive list—just a quick overview of some key apps. The People app aggregates contact lists from a number of services into one place. 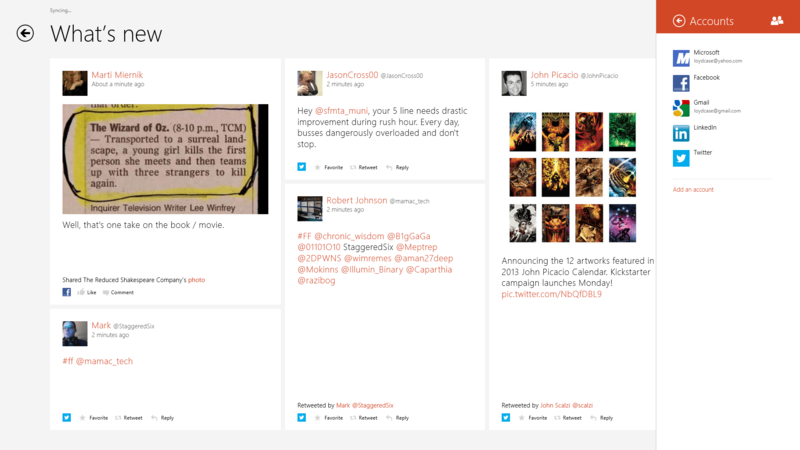 You can also get updates from your Twitter and Facebook feeds. You can respond to individual messages, but you can’t post global updates to Facebook or Twitter. The People app aggregates all your contacts. You can also see most social media updates from your contacts in the People app. Mail has improved substantially since the Consumer Preview. Previously, I couldn’t connect to my Yahoo mail account, but it now works with Yahoo mail, Gmail, and POP mail services. Mail is simple, but also straightforward. And it now works much better than in the Consumer Preview. Calendar is pretty simplistic. You can tie it in with Google and Yahoo calendars, and make edits, but navigation is pretty basic, as are the various views. 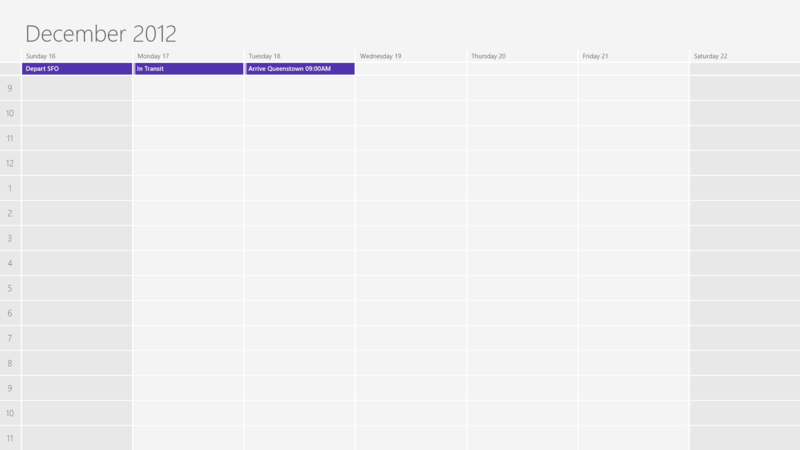 The very basic Calendar aggregates your schedule. The Messaging app as it stands is extremely limited—you might even say it’s broken. You can update your Facebook feed and interact with the three people you know who use Microsoft Messenger. It’s a far cry from a universal messaging application, so until Microsoft improves it substantially, it’s more a toy than a useful tool. The Photos app is slick, albeit a little shallow. 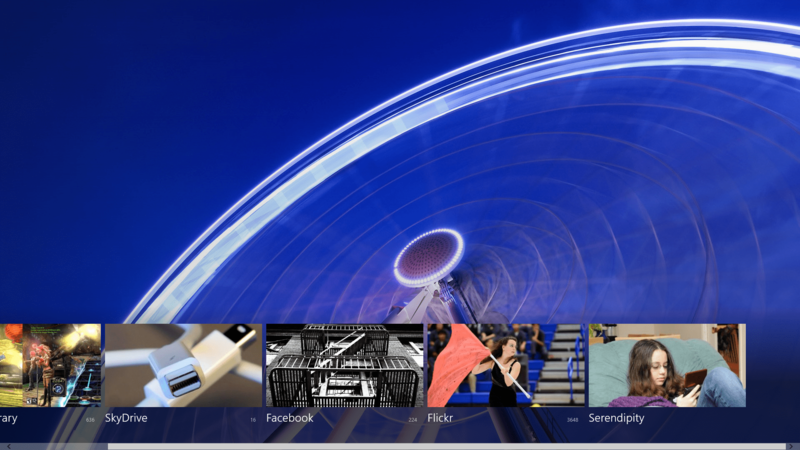 You can access your Facebook, Flickr, and SkyDrive photos, and you can create slideshows. You can’t, however, edit photos or even launch a photo-editing application. Photos shows you your pictures from multiple sources, including other PCs on your network. Zooming to individual photo sources reveals greater detail. The Microsoft Store is the location for finding and buying new Windows 8 apps—the ones that you load off the Start screen. You need a Microsoft account to buy apps, or to download the many available free apps. Note that desktop software may also be listed in the store, but clicking on those tiles will just take you to the manufacturer’s website. You can’t download desktop software from the Windows Store. The Microsoft Store is approaching 10,000 apps, but it still has a ways to go to catch up with iOS or Android. The Music app is confusing, partly because it’s labeled “Xbox Music” once you click inside, and because it’s a location for both purchasing music (as with iTunes or Google Play), as well for listening to free streaming music (as with Spotify or Rdio). You can also play your own music, but the interface for local file playback is obtuse to say the least. Luckily, Windows Media Player is still available on the desktop for when you need a more robust music playback app. If you’re an iTunes user, you can just download and install iTunes. iTunes works fine, but it’s currently a desktop-only app. The music app. The video app looks quite similar. Both carry Xbox branding. 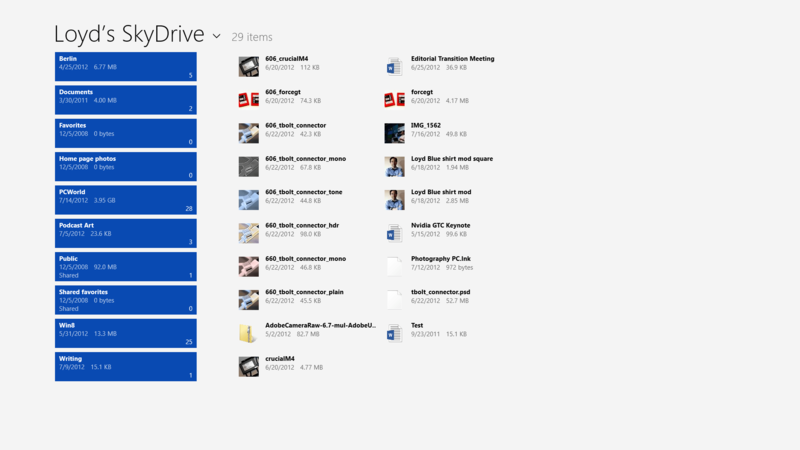 The SkyDrive app lets you access your SkyDrive content. It’s not nearly as flexible as the SkyDrive desktop application, with its associated folder. But this app is slick looking. 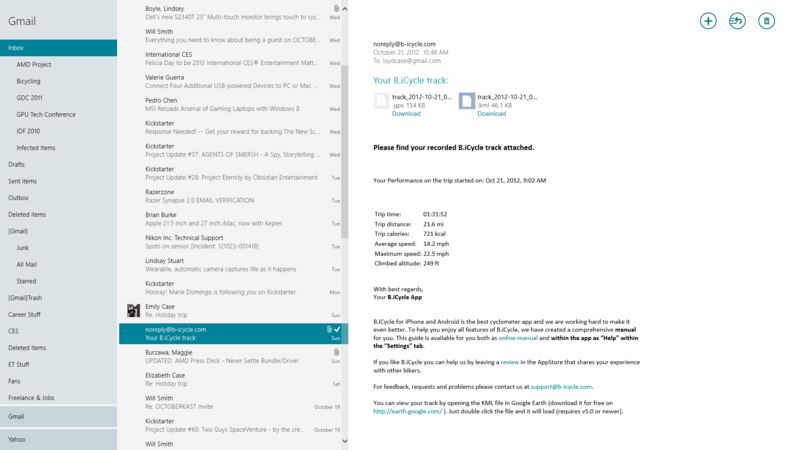 The SkyDrive app is a good companion to the desktop app, but you really will want to get the desktop app. By now, you’re probably past your first 30 minutes with Windows 8. There’s a lot more to learn, but much of what you learned with Windows 7 still applies. Take the desktop, for example. 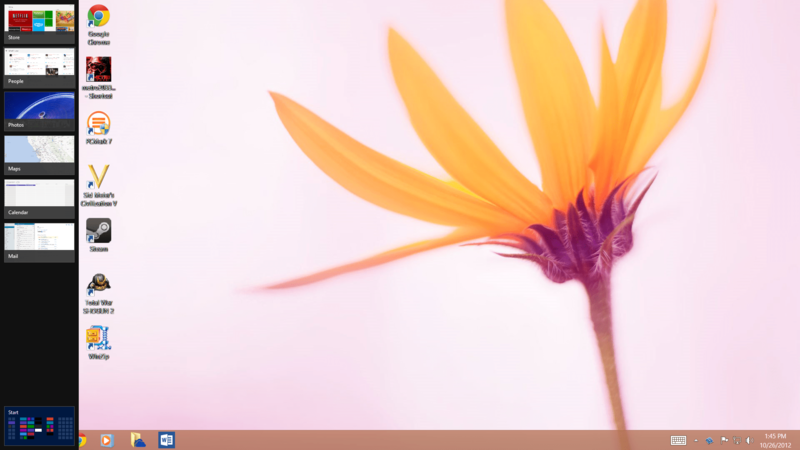 Sure, the classic Start menu is gone, but the Simple Start menu (Windows-X) should ease some of the pain of finding system-level programs. The taskbar on the desktop works as before, too. You can drop any desktop application (though not Windows 8 apps from the Microsoft Store) onto the taskbar, just as you did in Windows 7. Also, the task manager has been enhanced, and you can now set up your startup items there. But I digress—those are things to do in your subsequent use of Windows 8. Right now, you’ve gotten familiar with basic navigation, you’ve set up networking, and you’ve created user accounts. There’s more to learn, but that alien feeling you first experienced when starting at the active tiles in the Start menu should be fading. It’s your PC, so take control.